Craig Jones (craig_jones) created T63863: Dyntopo Sculpt on 3 Objects with Lock Object Modes Off. 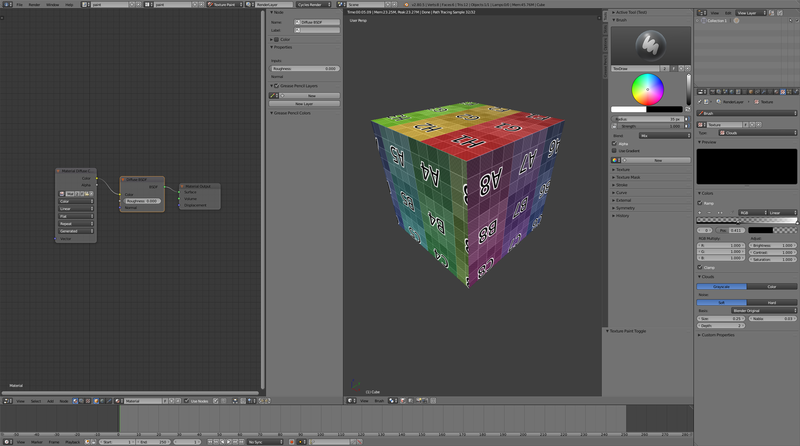 Craig Jones (craig_jones) added a comment to T56648: Blender 2.8: Naming Conventions. Could we rename Brush Curve into something more functional? Currently it is just Curve, and in other 2d software it is referred differently like 'hardness' or 'shape' etc. Craig Jones (craig_jones) awarded T61209: Always write unused IDs on save a 100 token. Andrew Charlton (Scaredyfish) awarded T58727: Mask Tool has no working visualization a Cup of Joe token. Craig Jones (craig_jones) added a comment to T59323: Display As Solid doesn't work in Texture Paint Mode. I have gotten confused - the secondary object for the mask can be in object mode, and that can be set to solid or wire as expected and still be able to draw the texture paint on the paint object. My apologies. Craig Jones (craig_jones) added a comment to T58727: Mask Tool has no working visualization. So can we get a proper visualization then? All we need is to see the color as if it is a transparent texture on top of the stack that is painted in, and be able to invert it as before. This is still broken, and is as invisible as the cavity masking now. If you want to really do a great thing, enable to visualize the mask as well as a secondary color for the cavity masking feedback as well. Craig Jones (craig_jones) awarded T60577: 2.8 Color sampling alters color value a Like token. Craig Jones (craig_jones) created T59323: Display As Solid doesn't work in Texture Paint Mode. Craig Jones (craig_jones) edited projects for T58727: Mask Tool has no working visualization, added: BF Blender: 2.8; removed BF Blender. Craig Jones (craig_jones) created T58727: Mask Tool has no working visualization. Craig Jones (craig_jones) added a comment to T56744: Proposal: Improving Brush Workflow in Blender. Looking forward to the artist favorites sorting for the brushes, as this would be very helpful toward keeping workflows already done in 2.79 - have to ask if we will be able to access favorites across tools? Current state of dev makes sense but limits access from the Tool panel in the Properties editor, but if we could have a way to group brushes from different tools together as a tool kit set, that would be fast. Craig Jones (craig_jones) awarded rBff9e0b67812a: Fix sculpt curve stroke paint a Love token. Yes, in 2.79 I select all the time when painting - I have two or more objects, each selected and then switched to Texture Paint mode. After all are in Texture Paint mode, then simply select the one you want to paint and go, and then select the next and paint. Face select masking also, must have selection as active for use here. With the Quick Access on rmb, is this assuming lmb selection then? Because I need to be able to select an object to continue painting on it if I am painting multiple objects with lmb as my stroke/dab/fill etc. I often use paint and sculpt on multiple objects at once. If I do, will I then have another keymap for the quick access that you put on rmb then? Just trying to understand what it will cost for me to keep my ability to select and paint/sculpt. Craig Jones (craig_jones) awarded T56744: Proposal: Improving Brush Workflow in Blender a Like token. Craig Jones (craig_jones) awarded T56648: Blender 2.8: Naming Conventions a Love token. When working with turning boxes using a lathe, it is the process of spinning the object to cut away from it. The Spin tool actually spins the selected geo around the cursor position. I think we get the same meaning from both, and I think Lathe is more common with other software, not necessarily a different meaning. Might make things easier to explain, all of these changes I mean. Craig Jones (craig_jones) awarded T56571: Tools: Per-tool Todo List a 100 token. Craig Jones (craig_jones) added a comment to T56571: Tools: Per-tool Todo List . Texture Paint Mode - same as Sculpt mode, need a brush to be default instead of the cursor in the 2d and 3d view. Craig Jones (craig_jones) awarded T56510: Blender 2.8 Splash Screen Design a Mountain of Wealth token. Craig Jones (craig_jones) awarded D3617: Workbench: Add Curvature overlay for better visibility of surface detail for e.g. sculpting a Mountain of Wealth token. Craig Jones (craig_jones) awarded T56012: Stencil Brush misalligned a Love token. Craig Jones (craig_jones) added a comment to T55463: Texture Paint - Eraser brush missing. EZ Paint add-on has a toggle for specific mix modes in painting that allows to flip between these two modes, that is what I use in 2.79. Craig Jones (craig_jones) created T56026: 2.8 Add Brush Texture Crashes Blender. Craig Jones (craig_jones) added a comment to T54040: Texture Panel in Brush , Brush Mask options for Properties Panel doesn't show. Here is the file saved compressed in 2.8. Here is a test cube with the default generated texture and color grid and a cloud texture as a brush texture. Okay, I see now. If using Eevee for painting, they do not appear. If using Cycles, they appear - but you can't use them really in Cycles, so we must wait for the Workspace engine to be built or for Eevee to support painting. Thanks for looking. Craig Jones (craig_jones) created T54281: Pen Stroke in 3D view for Texture Paint. Craig Jones (craig_jones) awarded D3094: Cycles: add anisotropy to random walk subsurface scattering. a Love token. Craig Jones (craig_jones) assigned T54040: Texture Panel in Brush , Brush Mask options for Properties Panel doesn't show to Dalai Felinto (dfelinto). Craig Jones (craig_jones) created T54040: Texture Panel in Brush , Brush Mask options for Properties Panel doesn't show. Craig Jones (craig_jones) awarded D3054: Cycles: random walk subsurface scattering. a 100 token. Craig Jones (craig_jones) awarded rBc621832d3d35: Cycles: CUDA support for rendering scenes that don't fit on GPU. a Love token. Craig Jones (craig_jones) added a comment to T52914: Add a new Selection tab. I added it as an addon submission, and made a fast wiki on my github. Craig Jones (craig_jones) created T53144: Selection Panel. Craig Jones (craig_jones) claimed T52914: Add a new Selection tab. I did start this and was based on the communication on rightclickselect.com, but I approached it as an addon for now since I don't have a lot of experience with source and was unaware of this thread. I have my version available to look at on my github at https://github.com/artistCDMJ/selection_panel. If this is on the right track, then I would be willing to continue work on it with input from devs. Craig Jones (craig_jones) awarded rB9e40977c271e: UI: Add Open Image button to Mask Stencil Image panel a Love token. Craig Jones (craig_jones) added a watcher for BF Blender: 2.8: Craig Jones (craig_jones). Craig Jones (craig_jones) awarded rB7abed4e4332e: Fix T51867: Insert Keyframe I - L / I - R / I - S key combos are broken. a Love token. mic lack30 (miclack) awarded D2710: Open Image button added to Mask Stencil Image panel a Love token. Craig Jones (craig_jones) created D2710: Open Image button added to Mask Stencil Image panel. Craig Jones (craig_jones) created T50020: Image Sequence Frames to Use. Craig Jones (craig_jones) created T49998: Load Factory Settings fails. Craig Jones (craig_jones) awarded rB26bf230920cb: Cycles: Add optional probabilistic termination of light samples based on… a Baby Tequila token. Craig Jones (craig_jones) added a comment to T48532: Mishandled Alpha when using Color mix mode in Cycles Texture Paint. This is unfortunate that it needs to work this way, but I do appreciate the tip - alongside that since the ability to vary the amount the image affects the lower image is taken away from just being the Factor in the mix node, I added an RGB Curve node between the second image Alpha and the Mix Factor and 'lessened' the overall effect by manipulating the control point on the far right. I will adjust to this for now and just try to pass this on. Thanks! Craig Jones (craig_jones) created T48532: Mishandled Alpha when using Color mix mode in Cycles Texture Paint. Craig Jones (craig_jones) created T48273: New Mask Causes Crash. Craig Jones (craig_jones) added a comment to T48117: Flip the Render. Interesting. As a painter, I have helped make a small addon with some macros I use for flipping an image plane when painting in the 3d view since the image Editor had not supported this (yet). I use the flip x for seeing problems with my painting and the forms, but even more so I use the flip y for comparing to my source image also flipped y to catch problems with negative space and eliminating errors when thinking 'eye', 'nose', or other feature and working from knowledge instead of observation. Craig Jones (craig_jones) added a comment to T48113: Shift Numpad 7 Align to Top View for Selection Inconsistent. Thank you for looking - I guess that I assumed that the use of the face selection meant that TexPaint mode had some sort of selection there, but I made a simple operator for now that shuffles back to edit mode, aligns, and then back to texpaint. I hope the functionality is added later then, or maybe once I learn to really code then I can help with that. Craig Jones (craig_jones) created T48113: Shift Numpad 7 Align to Top View for Selection Inconsistent. Craig Jones (craig_jones) added a comment to T44555: Color panel in Blender Render texture stack doesn't affect GLSL preview, but does affect render preview. I appreciate the explanation - I can understand if this is too much for GLSL right now. Work around I have is to use the compositor to make adjustments and iterate saves, and then just bring them in to toggle on and off until deciding on best case. Craig Jones (craig_jones) created T44555: Color panel in Blender Render texture stack doesn't affect GLSL preview, but does affect render preview. Craig Jones (craig_jones) added a comment to T43667: Texture Paint Brushes not kept when opening older files. Thanks for the confirmation. I had gotten really happy to use the Fill tool for variating base color on a mesh, but when I opened files from our SVN, the tool wasn't available again. Then I opened older paint files, and still nothing, and this included the custom brushes I had saved to my startup. Are they there when opening older files from pre-2.73? This is the crux of my problem, that they are not available unless I append from a newer file. I have the same problem though with brushes from 2.73a vanilla that should be there, but opening an older file leaves me with just the tools available in the previous version. Craig Jones (craig_jones) created T43667: Texture Paint Brushes not kept when opening older files. Craig Jones (craig_jones) added a comment to T37960: Update brush icons. Will we be able to set a short cut to Mix Mode maybe? Not a feature request, just asking if that is possible from these changes. Craig Jones (craig_jones) added a comment to T38346: Add Tabs to 3D View Paint Modes. @xrg (xrg) I keep a properties window open to brush texture and mask texture just for that purpose sometimes. It is easier there for the procedurals and set up of the texture brush/mask textures as well. In all of the mockups so far, I think the important thing to remember is that some panels are default to closed, some as open, and you can clean up by closing panels from the default open. I like the mock up of the sculpt mode in that it attempts to sort out the lesser used panels, but across the board in all the paint tools like vertex paint, texture paint, weight paint, etc,those option settings are necessary depending on the function needed, so pushing to a new tab isn't really going to help speed things up unless they are really lesser used items.